That’s the first paragraph in The World in 2019 by The Economist, which contains an assessment of events in 2018 and predictions for 2019. Editor David Franklin believes that by midyear, the US will break its record for the longest interrupted expansion and could head into a recession by late 2019. He predicts that China’s growth rate will slow down while India’s will speed up. When our giant neighbour became independent of the raj in 1947, it had less than half the GDP of Britain. But despite its recent devaluation problems, India is expected to overtake the UK’s GDP at market rates this year. It is said that the US stock market will fall back while the rest of the world’s exchanges will rise. Meanwhile, countries including India – which accounts for more than a third of the world’s population – will have elections. And there is some optimism that this will be the beginning of a reversal of declining freedoms. Franklin has not taken Sri Lanka, once recognised as a five-star democracy, into account in his predictions. President Donald Trump remains the main focus of The World in 2019, which says that he has divided America and dominated world affairs to a far greater degree than any other US president. Trump’s style reflects diplomacy by threat and contempt for conventional norms of presidential behaviour plus a reality television star’s desire for attention. Critics consider Trump a catastrophe due to his abuse of power and divisive rhetoric, which threatens the fabric of American democracy. His transactional and bullying approach to international leadership is described as economically illiterate, morally bankrupt and strategically short-sighted. But his supporters consider him a hero. In Europe, the faulty defence spending of European allies is also under the spotlight. The Economist points out that while the US economy has been booming, that is largely because it is in the midst ofa ‘sugar high’ thanks to a fiscally irresponsible tax cut. As far as China is concerned, the figure nine in 2019 is giving goosebumps to its leaders including President Xi Jinping who has amassed extraordinary powers over the last few years. Thirty years ago, political storm clouds gathered over the giant nation, which ended with bloody scenes at Tiananmen Square in 1989. Xi is definitely all-powerful in China. And his sweeping clampdown on civil society – with many lawyers, NGO workers and human rights activists being arrested, and jailed – has certainly helped reduce the extent of critical opinion. As the trade war with the US gains momentum, he’s expected to redouble efforts to exercise greater control over China. In the context of Britain, The Economist calls it 2019’s ‘murder mystery’ and adds that no one killed Brexit as it was never alive! The regulation of AI – especially the scramble to obtain data needed to train systems to infringe on peoples’ privacy – is yet another cause for concern. This involves monitoring everything that people do online from shopping to reading, which allows internet giants to access detailed personal profiles on potential advertising targets. Meanwhile, Beijing is fine with its internet giants gathering personal data… as long as the government has access to it too. The Economist warns readers not to fall for the argument that because democracy is flawed, a strongman might be better. Its Foreign Editor Robert Guest says that autocratic governments often sow the seeds of their own demise and when dissent is silenced, leaders stop hearing wise but unwelcome advice. He adds that when checks and balances are dismantled, graft metastasises and weakens the regime. If 2018 saw popular disgust at official thievery bringing down the leaders of Malaysia and South Africa, Sri Lanka’s President Maithripala Sirisena is a study in contrast. In 2015, the president promised voters that he would deal with corruption in the former government. Instead, three and a half years later, he teamed up with those very same individuals and turned the tables on the party that helped him come to power. He now claims that the UNP is the party that is corrupt! 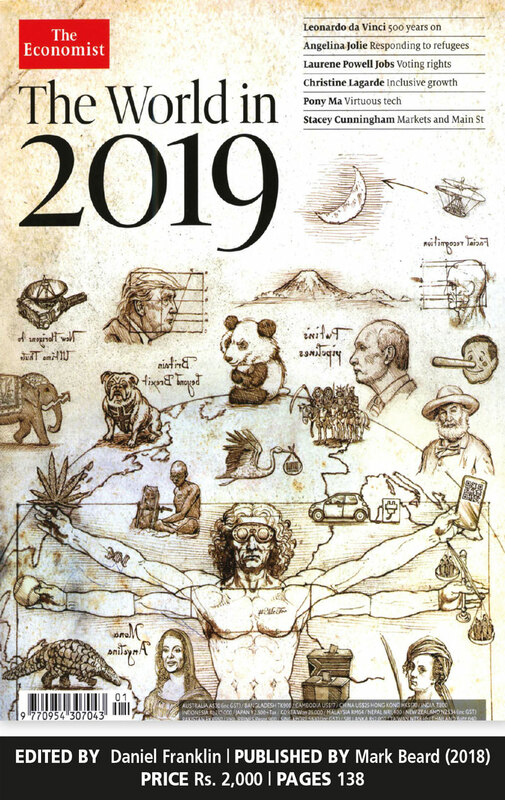 The World in 2019 is a publication worthy of perusal as it provides an interesting commentary on many countries. And its editor certainly doesn’t hold back his punches.